This is the second instalment of Philip White’s series on the much-overlooked Semillon. Semillon. Twas a Dane and an Alsatian, in the early ’80s, that peeled my brain open to the fact that there was Semillon outside the Hunter Valley. Peter Vinding-Diers, a Danish war correspondent who’d become addicted to winemaking, was in the Graves district of Bordeaux, making the finest, crisp, most beautifully-scented, bone-dry blends of Semillon and Sauvignon blanc. They were radical in their pristine freshness and were among the first Bordeaux whites I discovered to show what became badly called “minerality”. Peter gave a dinner at Jarmer’s and we talked of journalism and savoured his revolutionary whites well into the night. In 1982 the French Remy Martin bought Quelltaler Estate in Clare, and Francois Henri, Remy’s Australian boss, brought in an Alsace winemaker whose progress he’d admired. His name was Michel Dietrich. He’d got on a plane in a blizzard in Alsace and alighted in Adelaide in a 40+ Celsius heatwave, hired a car, drove to Clare, raised the French tricolour over the old Buring and Sobels winery, and asked for a back hoe. They thought he was mad. But he got his digger, and made pits around Carl Sobels’ old Riesling and Semillon vineyards, delineating which bits would be picked in which order. To Michel, fences and ancient headlands meant nothing. He was looking for, and found, chalk, which the locals called limestone. Years later, we worked out the chalky crust around Watervale was actually calcrete, which is different in its formation but chemically similar in its calcerious nature. Michel made exquisite barrel-fermented Semillon, almost the opposite of the Vinding-Diers style. These radical wines – for Clare, and even Australia – made the most of those austere chalky tannins, but lavished that bone-china basement with the creamy lemon-butter which is rich in the best low-yielding Semillon, and provides sufficient unction and flesh to soak up some serious French oak. If the corks work, his ’82, ’84 and ’86 wines can still drink remarkably well. But in the wine biz, stuff changes. Vinding-Diers was out of luck, perfecting his take on the whites of Graves just as white fell from favour in the Bordeaux markets and many there began making cheaper, more approachable reds. After stints making wine all over the world, he’s now in Sicily, making, among other things, good old-fashioned Shiraz. Dietrich went back to France to start his own winery in Bordeaux when Remy sold Quelltaler to Wolf Blass, who changed its name to Black Opal. When Remy-Blass became Mildara-Blass, eventually disappearing into Southcorp/Fosters/Treasury or whatever it then was, viticulturer Vic Patrick pulled Carl Sobels’ priceless Semillon out to replace it with, er, Merlot. The mothballed winery is now called Annie’s Lane. Then, in 1990, Tony Brooks called to tell me with relish of a Bordeaux Frenchman, Jacques Lurton, who’d just made a beautiful barrel-matured Semillon-Sauvignon blanc at Greg Trott’s Wirra Wirra. He adventurously called this Fleurieu Heritage, the first winemaker I knew to recognise the Fleurieu. Jacques had worked the 1984 vintage at McWilliams in Griffith, where he discovered Australian Semillon. He moved to Petaluma, whose Croser-Jordan team introduced him to Wirra. 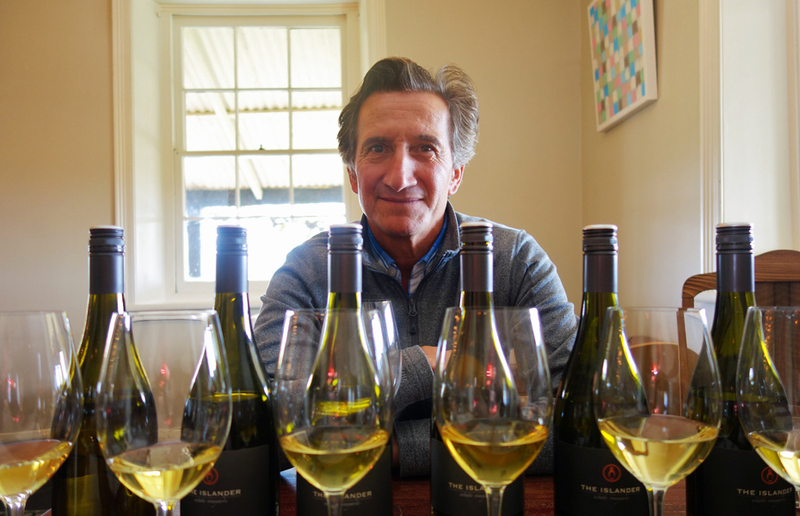 Infatuated with Kangaroo Island’s viticultural potential, he eventually bought a big swathe of land near Parndana in 2000, which he called The Islander Estate. Among other things, he planted Semillon. Revering the style he’d seen at Quelltaler, Jacques was straight into barrel-fermented Semillon. He used big 600-litre demi-muid barrels (a standard Bordeaux barrel is 225l), and to increase the viscosity he picked in two stages: one early, to best entrap the schisty “minerality” of the site; then again later, to maximise what he calls the “oily mouthfeel”. He came with a full set of his vintages, and the last surviving bottle, a magnum, of that 1990 vintage he’d made at Wirra Wirra. We talked of how Semillon has won itself no favours in the fashion stakes, as most of Australia’s product is grown at great tonnages in the Murray-Darling, where it makes a watery, neutral, general-purpose bulk booze for anything from cheap fizz to stretching Chardonnay. “These are of thick oak,” he says, “so there’s no transfer of air and this provides good insulation without too much raw oak flavour … I like to finish with a wine which is more like a good burgundy. I use only a yeast from Mersault. I like the cream of the Semillon. In the early vintages of The Islander Semillon, which he impishly calls The Wally, he added tiny amounts of Viognier, just 2 to 5 per cent, as he wasn’t convinced the baby Semillon vines would produce enough of that comforting oiliness he sought. When his wife died in 2009, Jacques missed a vintage. Upon his return from France, he examined his arsenal of back vintages and decided the Viognier was no longer necessary. The ’05 is all cream and lemon butter, and softening in the tail. There is no tannin. ’06 has more obvious schisty tannin and better natural acidity. When I was a kid in the mountains of east Victoria, it was a gastronomic treat to taste the rainwater from the hollows of old tree stumps. The Italians who settled after the war sometimes kept a rainbarrel, an old wine barrel with one head knocked out to collect the roof water from outbuildings. Sometimes the women would float lemons in this water to give it even more freshness. These wines, in particular this ’06, reminded me of the raintree or rainbarrel with lemons. With its lovely lemon butter and cream, the ’07 had better balancing acid, much after the oxalis of rhubarb. With another year of age, the vines were rocking by ’08: the acid more pronounced, the schist really evident and acrid in the aroma. After that sad year off, the wines change gear. They’re brighter green, without the burnished gold imbued by Viognier. The ’10 is all lemon and lime with that beautiful buttery balm; gorgeous and perfectly formed; the ’11 even better, with the grassy edge of methoxypyrazine creeping into its floral fragrance and that rainbarrel water neatly counterpoised with its lemon butter and lime. The ’12, the current release, from a very warm year, seemed more conventionally along the lines of Sauvignon blanc, perhaps because it was picked a touch earlier. This slender aspect seems to leave the oak exposed. It’s not intrusive, however. And then ’13, which is exquisite. Along with the ’11 (both 94-95++ points), it’s my clear favourite: elegant, stunning and built for very long maturation in the cellar. It’s Jacques’ favourite, too. “This is the wine I want to make,” he said with a smug grin. “After these many years, it is my best translation of Kangaroo Island.” You won’t see this release till Christmas. Then came the magnum of Fleurieu Heritage – 25 years old, with an average cork. Burnished gold like autumn leaves, and reeking of butter and lemons. Think beurre blanc, or hollandaise sauce with its squeeze of lemon. And yes, “minerality” still fresh in there like chalk, stretching the finish out long and slow and easy, where the finish left me with that serendipitous recollection of the raintree. For old times’ sake, we took it home to Wirra Wirra, and guess what? We drank it on a rainbarrel. Somehow, the delicate scent of that slightly-oaked water made perfect sense of everything. All vintages of The Islander Estate Vineyards The Wally Kangaroo Island Semillon are under screw caps. The current release is $35.